OutlookFiller - import .eml files into outlook. Import .msg files into outlook. 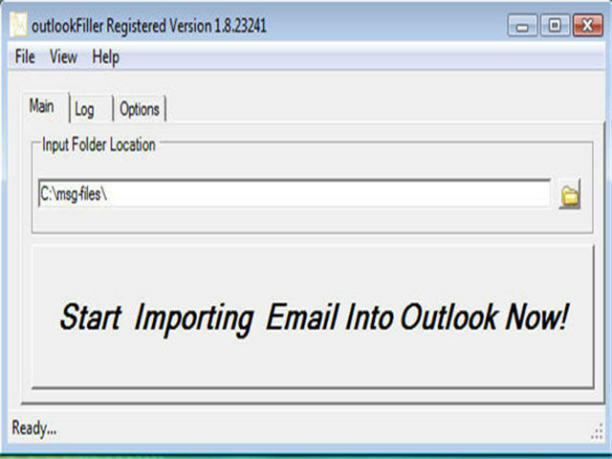 With OutlookFiller you can import rfc822 e-mail files, and outlook .msg message files directly into outlook. If you have outlook and a e-mail files saved from an e-mail program you used to use, it is the perfect utility for you. New version has added Unix to does conversion option plus minor improvements and bug fixes, added option to use sent date as recieved date. import .eml files into outlook. Import .msg files into outlook. ...... 24006 has added Unix to dos conversion option plus minor improvements and bug fixes, added option to use sent date as recieved date. With outlookFiller importing the .eml and .msg files to Outlook becomes easy as a cakewalk. It would prove to be a perfect utility for transferring bulk of files altogether. With few simple steps you can get the work done with ease. Qweas is providing links to OutlookFiller 1.8.3207.24006 as a courtesy, and makes no representations regarding OutlookFiller or any other applications or any information related thereto. Any questions, complaints or claims regarding this application OutlookFiller 1.8.3207.24006 must be directed to the appropriate software vendor. You may click the publisher link of OutlookFiller on the top of this page to get more details about the vendor.